Based on PVMBG observations, the Darwin VAAC reported that on 12 March an ash plume from Ebulobo rose to an altitude of 3 km (10,000 ft) a.s.l. (800 m above the summit) and drifted W.
Our last report (CSLP 19-69) discussed a summit eruption at Ebulobo stratovolcano, near the S coast of Central Flores island, that in 1969 had emitted ash and steam as well as "fire" (generally taken as incandescence but also possibly flames). CVGHM (Center for Volcanology and Mitigation of Geologic Disasters), issued a report on Ebulobo on 26 August 2013 informing readers that during August 2013, observers noted one or more hot emissions escaping from the crater. The resulting plume was of sparse consistency, white in color, under weak pressure, and it rose to 5-30 m above the peak. "Smoke" was noted. The CVGHM report noted that on the night of 21 August 2013, observers on the volcano's N side saw incandescence at the summit area. Observations during the night of 22-23 August revealed points of glowing remained unchanged. The glowing was considered anomalous, having not been seen since 2011. The exact cause of the incandescent regions was not reported No new fissures, lava flows or pyroclastic flows were reported. The glowing later terminated as discussed in an October follow up report. During June 2013, the system recorded the earthquakes shown in table 1. Table 1. A summary of seismicity recorded at Ebulobo. Dashes signify cases without reported data. Extracted from the 26 August and 17 October CVGHM reports. During 1-22 August 2013, the seismic system also recorded tremor with maximum amplitudes in the range of 0.5-15 mm. Ebulobo (figure 1) has a dedicated observation post and two seismic instruments as discussed further below. Figure 1. Ebulobo as seen in a photo taken 9 June 2009. Copyrighted photo by Andrzej-Muda. Glow diminishes and Alert Level drops (to I). During September-October white plumes rose as high as 100 m above the crater. Despite that, the glowing area had remained absent after 27 August. On 17 October CVGHM scaled back the Alert from II to I (Normal, on a scale that reaches IV). More background. The following was extracted from CVGHM reporting. "Ebulobo Volcano is located in the district of Nagekeo, province of Nusa Tenggara Timur. Eruptions of Ebulobo generally have consisted of lava streams that quickly formed mounds but have never so far resulted in sudden eruptive outbursts that produced a symmetrically shaped mass to the volcano. Ebulobo's eruptions have occurred between 3 and 58 years. In its historical record, its latest eruptive activity took place in 1941 and consisted of a lava stream. "Observation of Ebulobo's activity is carried out from its monitoring post in the village of Ekowolo, sub-district of Boa Wae and is done visually and according to tremor events. The monitoring is done by means of a Type VR-60 seismograph and a Type L4C seismometer. The readings are transmitted by a telemetric system." Information Contacts: Center for Volcanology and Mitigation of Geologic Disasters (CVGHM), Jalan Diponegoro 57, Bandung 40122, Indonesia (URL: http://www.vsi.esdm.go.id/); and theNational Agency for Disaster Management (BNPB), Gedung Graha 55 Jl. Tanah Abang II No. 57 Postal Code: 10120, Jakarta Pusat, Indonesia (URL: http://www.bnpb.go.id/). "Mount Ebu Lobo . . . has begun activity, with fire and steam on summit and ash eruption." Information Contacts: Djajadi Volcanological Service via the American Embassy, Djarkata, Indonesia. Ebulobo, also referred to as Amburombu or Keo Peak, is a symmetrical stratovolcano in central Flores Island. The summit of 2124-m-high Gunung Ebulobo cosists of a flat-topped lava dome. The 250-m-wide summit crater of the steep-sided volcano is breached on three sides. The Watu Keli lava flow traveled from the northern breach to 4 km from the summit in 1830, the first of only four recorded historical eruptions of the volcano. There is no Deformation History data available for Ebulobo. There is no Emissions History data available for Ebulobo. Gunung Ebulobo (also known as Amburombu or Keo Peak) towers above the village of Boa Wae, located below the NW flank of the volcano. 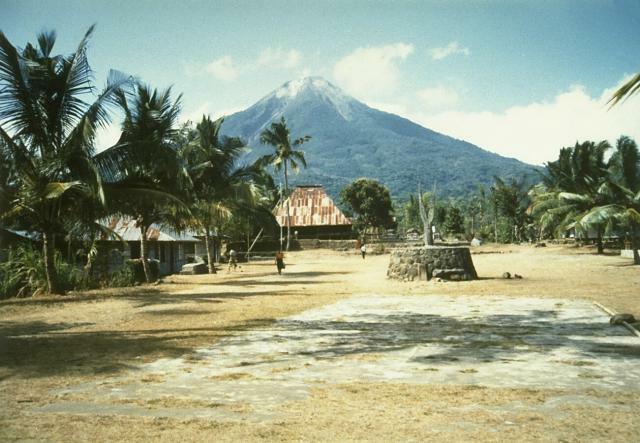 Ebulobo is a symmetrical 2124-m-high stratovolcano in central Flores Island with a flat-topped summit lava dome. Historical eruptions, recorded since 1830, include lava emission down the north flank and explosive eruptions from the summit crater. 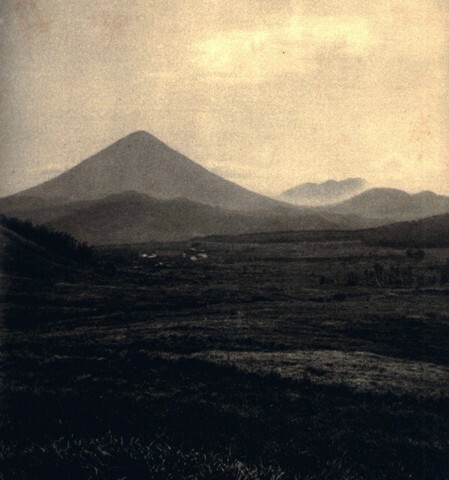 Photo by Willem Rohi, 1991 (Volcanological Survey of Indonesia). Conical Gunung Ebulobo, also known as Amburombu or Keo Peak, rises above the highlands at Toda Belu, SW of the volcano. Directly below the summit of Ebulobo is Roa volcano, and on the right horizon is Taka volcano. 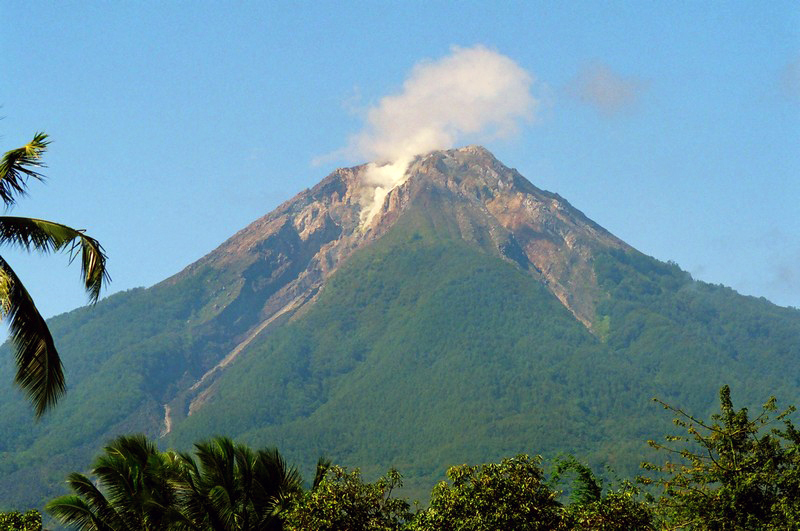 Dominantly explosive eruptions have been recorded from the symmetrical Ebulobo volcano since the 19th century. A lava dome occupies the sumit of Ebulobo volcano, also known as Amburombu or Keo Peak. The summit crater, seen here from the south, is breached in three directions. There are no samples for Ebulobo in the Smithsonian's NMNH Department of Mineral Sciences Rock and Ore collection. IRIS seismic stations/networks Incorporated Research Institutions for Seismology (IRIS) Data Services map showing the location of seismic stations from all available networks (permanent or temporary) within a radius of 0.18° (about 20 km at mid-latitudes) from the given location of Ebulobo. Users can customize a variety of filters and options in the left panel. Note that if there are no stations are known the map will default to show the entire world with a "No data matched request" error notice. Large Eruptions of Ebulobo Information about large Quaternary eruptions (VEI >= 4) is cataloged in the Large Magnitude Explosive Volcanic Eruptions (LaMEVE) database of the Volcano Global Risk Identification and Analysis Project (VOGRIPA).